How few disks are needed to cover a square efficiently? A unit square can be covered by a single disk of area $\pi/2$. Let us call the ratio of the square's area to that of the covering disks (i.e. the sum of the areas of the disks) the efficiency of the covering, so that in the base case with one disk the efficiency is $2/\pi\approx63.66\%$. Say that a covering is efficient if its efficiency exceeds this value. If we use a honeycomb (hexagonal) grid of $22$ equal disks in alternating rows of four and five disks, we get a covering efficiency of $24/11\pi\approx69.45\%$; so efficient coverings exist. Allowing disks of different sizes, how few are needed to cover the square efficiently? Can it be done with fewer than $22$ disks? 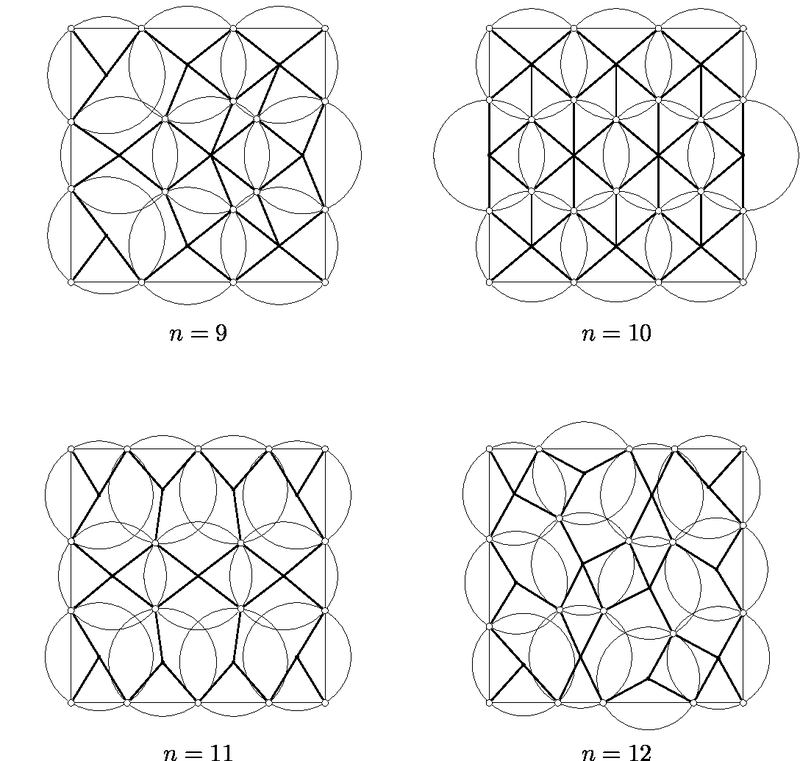 With a bit of Googling I found this paper: Covering a Square with up to 30 Equal Circles, by Kari J. Nurmela and Patric R. J. Östergård. 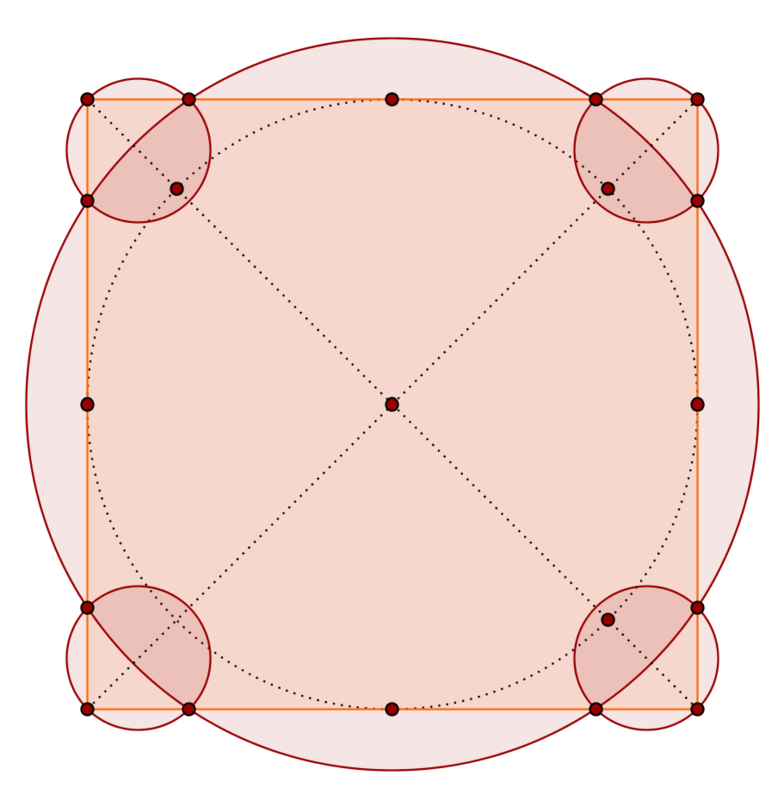 They used a computer search to find coverings of a square by $n$ equal circles, where the radius of those circles is as small as possible. They give a table of radius values, which I reproduce below. I've added columns with the total area of the circles and the efficiency. As you can see, they become efficient from $n=9$ onwards. Here's a picture from that paper of the first efficient arrangements $n=9 ... 12$. Of course it may still be possible that with fewer than 9 discs of different sizes you can make an efficient covering. Inspired by Jack D'Aurizio's solution I found that you can even make an efficient 3-disc covering. Calculating the optimal solution exactly is horrendous. Just by tweaking the numbers, the best efficiency I found with this configuration is approximately $0.693881$. I chose the large radius to be $0.6572$, and from that it follows that $|OG|=0.426511$, $|AE|=0.179029$, $|AF|=0.146978$, and the small radius is $|EF|/2 = 0.115816$. 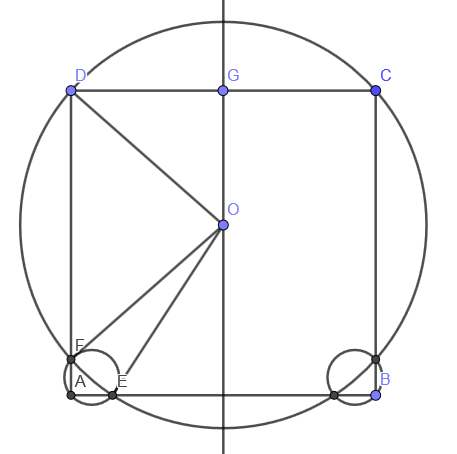 To complete the answer, here is a simple proof that 2 discs can never efficiently cover the square. Consider the 4 vertices of the square. If one of the discs covers two diagonally opposite vertices, then it will be as large as the 1-disc covering, and the non-zero area of the other disc will make any covering with those discs inefficient. 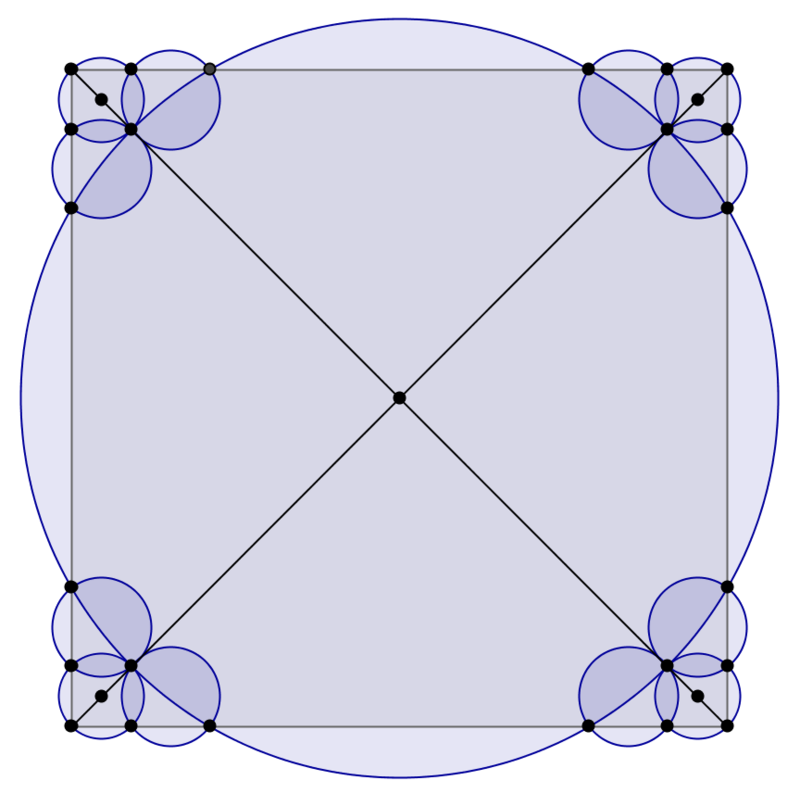 If either disc covers three of the four vertices, then it will cover a diagonal pair, and the covering becomes inefficient as explained above. 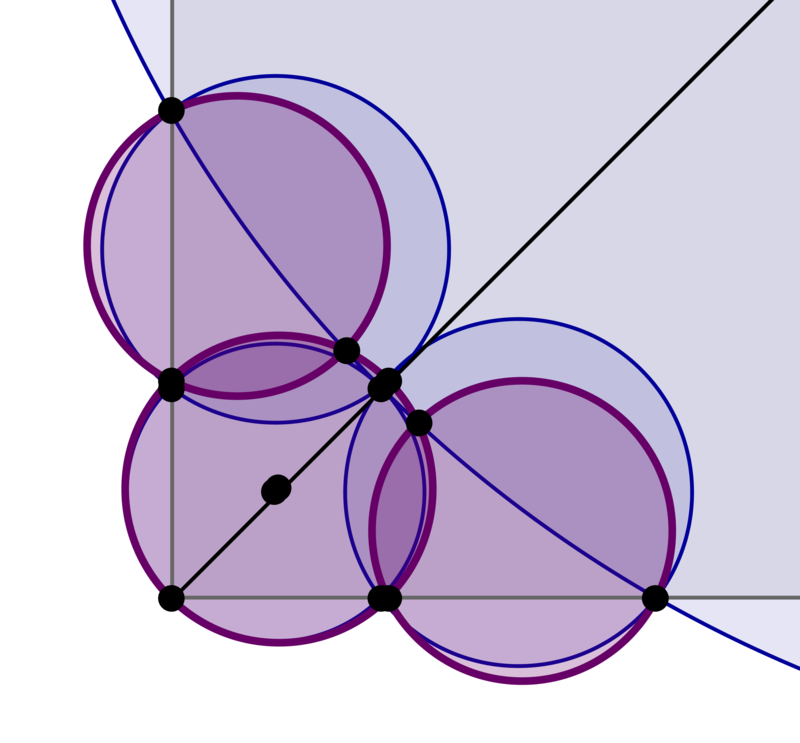 The only way therefore to cover the four vertices is if each disc covers two adjacent vertices. This makes their radii greater than $1/2$. This inequality is easily seen to be strict. Their combined area is then strictly greater than $\pi/2$, making any covering by them inefficient. Not the answer you're looking for? 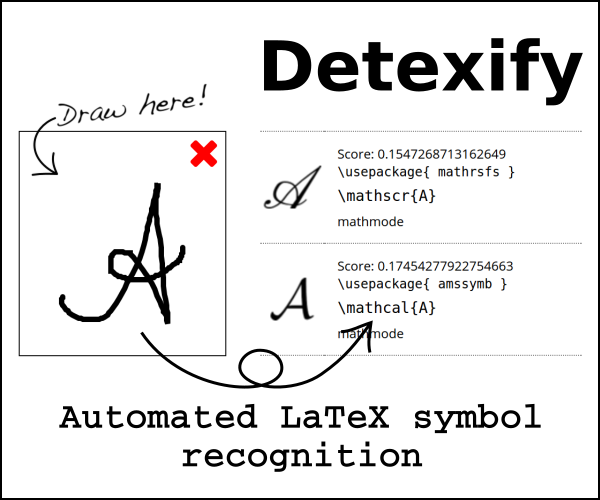 Browse other questions tagged geometry discrete-geometry tiling or ask your own question. How many circles are needed to cover a rectangle? Comparing The Rates at Which Squares and Circles Fill Large Similar Areas. Why can't three unit regular triangles cover a unit square? Can squares of infinite area always cover a unit square?